Central Asia: Can Secular Islam Survive? Uzbekistan offers insights into secular Islam within Central Asia and the legacy of Soviet influence. Quietly tucked away in the rugged region of Central Asia, Uzbekistan is often overlooked by Western policy analysts, treated as little more than an afterthought in the grand scheme of global affairs. However, with the Western world confronting the rising threat of Islamic fundamentalism, it may be time to take a closer look at the history of Islam in the region. Uzbekistan in particular offers a glimpse into what a secular Islamist state could look like, as well as the way in which religious repression often breeds extremism, violence, and state insecurity. The roots of secular Islam in Uzbekistan stretch back for more than a century. Arguably one of the most important movements in the region was that of the Jadids at the turn of the 20th century. The Jadidist movement later confronted the crushing authoritarianism of the Soviets, who used Central Asia for agricultural and extraction while neglecting its citizens. The Jadids sought to reform Islamic thought and embraced the concepts of technology, innovation, education, and women’s rights. For the Jadids, the concept of Islam was not rigidly tied to religious practices but was instead more about nationalism. Islam became a nation and Muslims became a political community. They provided the foundation for a more progressive, socially inclusive, and secular Muslim nationalism that is, for some people today, seemingly unimaginable. This secularism was greatly bolstered by the Soviet decision to close the borders of Central Asia and detach the region from its neighbors such as Turkey, China, and perhaps most importantly Afghanistan. Muslim intellectuals were cut off from their peers abroad. In turn, Islam became a much more localized force for Uzbek communities, which cemented Islam as a regional tradition. However, this isolation from the outside world also meant that the Uzbek Muslim community was insulated from the “political Islam” that was developed by Abu Ala Maududi and Sayyid Qutb (both of whom are credited with founding modern fundamentalist Islam). In this way, the Uzbek school of Islamic thought remained localized, nationalist, and mostly secular. Religious observance remained important, but it was not the defining characteristic of what made someone Uzbek. However, Soviet relationships with Middle Eastern allies would open the door to the politicized Islam that was gaining ground throughout the world during the 20th century. Increasingly, Central Asians were being allowed to study abroad, which exposed them to a much different form of Islam than that to which they were accustomed. For many Uzbeks, the only forms of Islam they knew were the local, community-based traditions of their families and that of the sanitized state-sanctioned official Islam, which was the Soviet response to its inability to eliminate Islam from Central Asia. The foreign students of Islam came to be known as unofficial ulama, or unofficial scholars of the faith, who spread an appreciation of a purer practice of Islam through stringent ritual and observance. The dichotomy between the unofficial and official versions of Islam, as well as between the versions localized and practiced for nearly a century and that which was being imported from the Middle East, became the fertile ground from which sprouted the current debate over the future of Islamic thought in the region. The outcome of this debate depends, in large part, on the legacy of the recently reelected ruler of Uzbekistan, Islam Karimov. A product of the Soviet tradition in Central Asia, Karimov remains the essentially uncontested autocrat in charge of the most populous country of the region. However, his brutal crackdown on dissenters within Uzbekistan has created a steady stream of supporters for Islamic extremism determined to overthrow his regime. While 93 percent of Uzbekistan identifies as Muslim, those who choose to worship outside of state-sanctioned mosques, possess banned Islamic literature, or are deemed “extremist” by the government are increasingly the subjects of state-organized and directed violence and persecution. Moreover, Karimov’s alliance with the United States has provided a convenient pretext for the continued persecution of Muslims within Uzbekistan. But instead of trampling extremism within Uzbekistan, Karimov has merely fueled the fires that threaten to overwhelm his finite hold on power. While there are those who would seek to overthrow the Karimov regime and replace it with a theocracy, the overwhelming majority of Uzbeks do not see this model as the key to a successful Uzbekistan. As Odil Ruzaliev pointed out in an article for the Journal of Muslim Minority Affairs, Uzbeks view a government controlled by radical Islam as inherently offensive. Uzbeks have a storied appreciation for education, art and culture, which stands in stark contrast to the archaic position of Islamic extremists that would see them burn books, destroy ancient artifacts, and sack sites of historical importance. 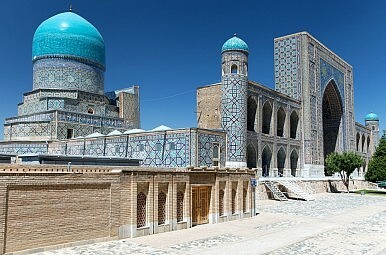 Uzbekistan remains opposed to the interpretation of Islam perpetuated by fundamentalists. They remain committed to their legacy of Islamic faith as a cultural and local institution devoid of the trappings of the politicization that can be witnessed in different corners of the world. Yet socioeconomic inequality, the repression of civil society, political dishonesty, and the persecution of religious minorities within Uzbekistan is directly contributing to the radicalization of some segments of the Uzbek population. The future of Islamic thought in the region is at risk of falling prey to fanatical interpretations that have been imported from abroad. For decades the vast majority of Uzbeks have resisted this influence, but will they continue to do so in the face of intolerance and persecution at home? It is the task of future generations of Uzbeks to break the bondages of Soviet authoritarianism and instead embrace a future dedicated to the Jadidi principles of intelligence, innovation, and inclusion. Erik S. Krausen is an active-duty member of the United States Air Force currently pursuing a Master of Science in International Relations at Northeastern University. The views expressed here are his own and do not reflect those of the U.S. Air Force or the U.S. Government.